It was present before Enoch, even before Adam. The scriptures reveal much about the priesthood, but they are not a handbook with references all gathered together in one place. They are scattered through the scriptures and were revealed at different times and in different places. Revelation continues: consider the recent announcement on the Seventy. One must prospect through and dig into the scriptures like a miner searching for precious metal. Scattered here and there are nuggets, some pure, and some alloyed with other doctrines. Occasionally one strikes a rich vein which will yield all that you are willing to earn, for the scriptures do not explain nor interpret themselves. If I were to draw a prospector’s map showing where I have found treasures on the priesthood, these are among the places I would mark: the Old Testament contains many choice nuggets, including references to Melchizedek, King of Salem (now known as Jerusalem). There is much to be mined in the New Testament; the sixth chapter of Hebrews is a rich vein of doctrine on the priesthood. In section 84 there is a genealogy which traces the priesthood back to Adam. (See D&C 84:6–17.) Another in section 107 (D&C 107:40–57) was included in instruction to the Twelve. The priesthood, once defined as the authority given to man to act in the name of God, is not ours to remodel or change or modify or abridge. It is ours to honor and magnify. While fathers and sons bear the burden of the priesthood, it was declared in the very beginning that it was not good for man to be alone. A companion, or “helpmeet,” was given him. The word meet means equal. Man and woman, together, were not to be alone. Together they constituted a fountain of life. While neither can generate life without the other, the mystery of life unfolds when these two become one. From the very beginning the power to beget life was unlawful to express except there be a marriage between the man and the woman. Marriage is a covenant of lifelong fidelity and devotion which, by ordinance, may last for eternity. The whole physical universe is organized in order that man and woman might fulfill the full measure of their creation. It is a perfect system where delicate balances and counter-balances govern the physical, the emotional, and the spiritual in mankind. The process by which life is conceived belongs only to those who have been legally and lawfully married. It was meant from the beginning to be veiled in total privacy. It was never to be degraded in idle conversation or to be the subject of unworthy humor. It was never to be exposed to public view, detailed in novels, illustrated in books, or acted out upon the stage or in films. It is never to involve children. And it is never to be perverted, never to be sold, never to be bought for money. The compelling need which draws a husband back to his wife is always to be expressed in tenderness and love. It is through this process that a wife may give her husband, and a husband his wife, a gift which can be received in no other way﻿—the gift of children. The separate natures of man and woman were designed by the Father of us all to fulfill the purposes of the gospel plan. Never can two of the same gender fulfill the commandment to multiply and replenish the earth. No two men or any number added to them, no matter how much priesthood they may think they possess, can do it. Only a woman can bestow upon man that supernal title of father. She in turn becomes a mother. Can anyone dispute that her part is different from and more demanding than his? The mother must endure limitations while nature performs the miracle of creation. Through her sacrifice, once again another spirit clothed in a mortal body crosses that frail footpath of life to experience mortality and the testing required in the plan of salvation. The well-being of the mother, the child, the family, the Church, indeed of all humanity depends upon protecting that process. The obligations of motherhood are never-ending. The addition of such duties as those which attend ordination to the priesthood would constitute an intrusion into, an interruption to, perhaps the avoidance of, that crucial contribution which only a mother can provide. The limitation of priesthood responsibilities to men is a tribute to the incomparable place of women in the plan of salvation. 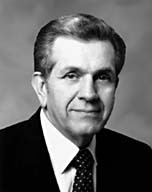 The prophet who said that “no success [in any field of endeavor] can compensate for failure in the home” (David O. McKay) did not exempt callings in the Church. Men and women have complementary, not competing, responsibilities. There is difference but not inequity. Intelligence and talent favor both of them. But in the woman’s part, she is not just equal to man; she is superior! She can do that which he can never do; not in all eternity can he do it. There are complementing rewards which are hers and hers alone. ﻿—And many other spiritual gifts. All under a uniform standard for worthiness. And the highest ordinances in the House of the Lord they receive together and equally or not at all! Many in the world now press for a melding of the identities of man and woman, claiming that the virtue of equality requires a homogenization of all relationships. Following an absolutely hopeless quest, some seek for an enduring physical and spiritual relationship with one of the same gender. That wicked deception has unleashed a pestilence which now threatens the whole of humanity. There can be no fulfillment there. To find fulfillment, they must﻿—and praise be to God, they can﻿—find it where it has been from the beginning. Some in the Church, following that trend in the world, have written doctrinal treatises trying to show that the scriptures provide for an exchange in the identities and responsibilities of men and women. They express concern that the leaders of the Church do not respond to their recommendations. Lest they bring sorrow upon themselves and their loved ones, I call to their attention a caution in section 121, beginning with verse 16, part of which I will quote. Ought not those virtues by which the priesthood must govern apply first and always to our wives and children, to our families? It was not meant that the woman alone accommodate herself to the priesthood duties of her husband or her sons. She is of course to sustain and support and encourage them. Holders of the priesthood, in turn, must accommodate themselves to the needs and responsibilities of the wife and mother. Her physical and emotional and intellectual and cultural well-being and her spiritual development must stand first among his priesthood duties. There is no task, however menial, connected with the care of babies, the nurturing of children, or with the maintenance of the home that is not his equal obligation. The tasks which come with parenthood, which many consider to be below other tasks, are simply above them. Sister Packer and I have seven sons and three daughters. And that, I have often been heard to say, is about equal value. They, in turn, have given us daughters- and sons-in-law, and grandchildren. When our sons were growing up, they enjoyed a very broad tolerance from their father toward their mischief and mistakes. But there was no tolerance for even the slightest disrespect toward their mother. As our sons have matured, I have ordained each in turn to the priesthood. Somehow that seems the lesser part. I have but ordained them. She has borne them, then trained and nurtured them. They are not my children and my grandchildren. They are our children and grandchildren. They all share in the blessings of the priesthood. I could not possibly express the depth and the intensity of love and gratitude that I feel toward my wife, the mother of our children. I know that the Son of God is our Redeemer. Reverently I give thanks to God the Father for the consummate blessing: a sweetheart, wife, companion, friend, a helpmeet, a woman! In the name of Jesus Christ, amen. Photo by Longin Lonczyna, Jr.